French Emblems: Emblem: Cuncta complecti velle, stultum. To want to be master of every subject is folly. Prendere dum satagunt, opera exit inanis. Ambiguos, pueris mihi stultior ille est. While the boys are busy chasing airy bubbles through the air, their efforts are spent in vain. He who appropriates a multitude of subjects for himself, or chases after doubtful* honours, in my opinion is more foolish than those boys. * With the suggestion of going in two directions at once, rather than of dubious repute. Marsya cede Deo, tua carmina flebis. ciunt, suaque spe elusi saepenumero discedunt. A band of little boys - sets of twins - should be portrayed, in which the one half are blowing bubbles or pompholygas from sea-shells (in which detergent, which we call soap, has been mixed with a drop of water) into the air. The other half are chasing them as they change colour like a rainbow and go purplish, and try to grasp them. Under their feet it would be rather good to have an inscription with that saying,* which is often on the lips of the Italians: “ET TUTTO ABBRACCIO, ET NULLA STRINGO”. As everyone knows, nothing is more empty or futile than a bubble, and for a long time now it has been likened to the shadow of passing mortality. And so it fits particularly well as an emblem for those who set their heart on different arts or sciences simultaneously, and are torn between different disciplines; or those who strive to fulfil many duties and to achieve many honours at the same time; or finally those who stagger indecisively to and fro after one thing or another, their voracious spirit never satisfied. For truly such people make too little headway, and deceived by their hopes, again and again they give up. *The literal translation of diverbium is [a line of] comic dialogue. 1. Marius Servius Honoratus, as in emblem VI ([FJUb006]). 2. 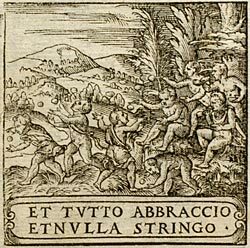 ‘I try to embrace everything and get hold of nothing’, after a line of Petrarch, Canzoniere, 134 (‘Pace non trovo’), line 4 (‘e nulla stringo, e tutto ’l mondo abbraccio’).